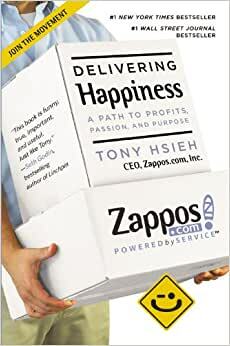 In Delivering Happiness, Tony Hsieh - the hip, iconoclastic, and widely-admired CEO of Zappos, the online shoe retailer - - explains how he created a corporate culture with a commitment to service that aims to improve the lives of its employees, customers, vendors, and backers. Using anecdotes and stories from his own life experiences, and from other companies, Hsieh provides concrete ways that companies can achieve unprecedented success. He details many of the unique practices at Zappos, such as their philosophy of allocating marketing money into the customer experience, the importance of Zappos's Core Values ("Deliver WOW through Service"), and the reason why Zappos's number one priority is company culture and his belief that once you get the culture right, everything else - great customer service, long-term branding - will happen on its own. Finally, Delivering Happiness explains how Zappos employees actually apply the Core Values to improving their lives outside of work, proving that creating happiness and record results go hand-in-hand. Start reading Delivering Happiness on your Kindle in under a minute. Tony Hsieh became involved with Zappos as an advisor and investor in 1999, about two months after the company was founded. He eventually joined Zappos full time in 2000. Under his leadership, Zappos has grown gross merchandise sales from $1.6M in 2000 to over $1 billion in 2008 by focusing relentlessly on customer service. An inspiring book gives you insights of not only how company culture can cultivate the growth of its employees and business but also to create a healthy partner ecosystem between vendors and investors. Brilliant. Such a compelling story of the true path of entrepreneurship. Part story part playbook, it delivered me a lot of tips to implement for customer happiness. Tony's journey in finding Zappo's, funding it, then eventually running it was unique and compelling. His long tracts about his business philosophy, less so.